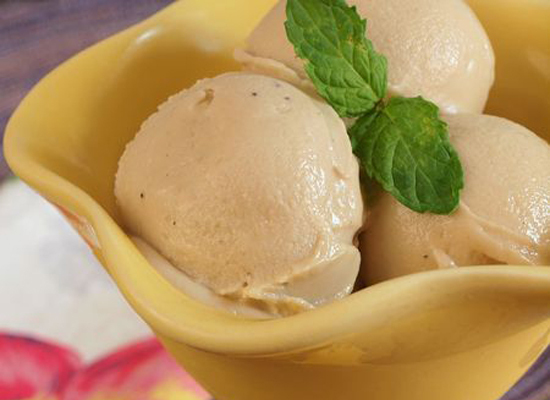 Beat the heat and enjoy this cooling, healthy ice-cream suitable for diabetics and all those who have blood sugar related issues. with this recipe you no longer need to worry about your sugar levels! Enjoy the heat with this recipe and don’t forget to write in and tell us how you liked the dish. Combine the milk powder and cornflour with 1 tbsp cold milk in a bowl and keep aside. Boil the milk in a non-stick pan, when it starts boiling add the milk powder and cornflour mixture while stirring continuously. Simmer for 5 to 7 minutes till the milk thickens and keep aside to cool. To the cooled mixture add the cream, sugar substitute, brown bread crumbs, vanilla essence and mix well. Pour the mixture into an aluminium vessel, cover it and place in the freezer for 3 to 4 hours. Once the mixture has set, remove from the freezer and blend in a mixer till smooth. Add the walnuts to the blended mixture, pour the mixture into the same vessel, cover and place it in the freezer again till it sets. Just before serving, place the scoops of ice-cream in 4 individual bowls and serve immediately.